One ethnic leader told Amnesty International that "sometimes being just one mountain away" makes one a different ethnicity, and that if the true measure was in fact differences in dialect, "then even 135 would almost certainly be an underestimation". This is a clear example of the strategy of "divide and conquer" which the Junta Government has embarked on. The people who suffer this repression are the Burmese people and any individual or organization that has any kind of political power or have won seats in Burmese Parliament in the 1990 Election. Other strategies include propaganda, human rights violations, freedom of the press, provocations and cease fire agreement violations. The common denominator of repression is the Junta Government Forces. The people who suffer this repression are the Burmese people and any individual or organization that has any kind of political power or have won seats in Burmese Parliament in the 1990 Election. Migration from Burma to Thailand has become a rule instead of an exception. There are thousands of Burmese who go into Thailand seeking freedom of trading. Children in Children in Bhamo, Kachin State, Burma. Image by Colegota. Creative Commons Attribution-Share Alike 2.5 Spain license. The Image to the right is a young girl from Burma, from the Red Karen state: Kayah, from Kayaw-tribe, part Black Karen, but is born in Thailand. Kayaw and Black Karen living most in Shan States. Considering the number of different ethnic groups in Burma, is there a common language in place? Yes. And is there a democratic movement that has proven to be successful and which has united the voters of Burma? Yes. Aung San Suu Kyi won by landslide in 1990. The ethnic people in Burma want autonomy and equal rights. They want a federal constitution which will guarantee them these rights. This was already guaranteed to them in the Panlong Agreement. The Panlong Agreement was signed with General Aung San (revolutionary leader and father of Aung San Suu Kyi) before independence in 1948. General Ne Win in 1962 took all this away from them (the Burmese people) after he seized power in a military coup. Military leaders progressively seek to dominate the ethnic people in the way China has done to the Tibetan people. The image you can see here is a group of Buddhist monks smiling in Burma. Despite attempts to bring confusion to Burma by dividing its people, this article deals with the seven largest officially recognized ethnic minorities in Myanmar. Each makes up a majority in its eponymous state: the Rakhine, the Chin, the Kachin, the Shan, the Karenni, the Karen, and the Mon. Amnesty International has put together 65-page long report on the Ethnic groups there. 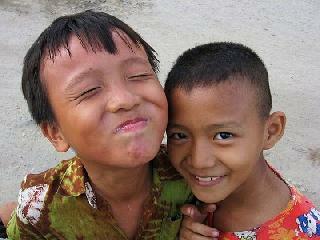 The Rakhine (also known as Arakan) are concentrated in Rakhine State on the western coast of the country. The Arakan League for Democracy (ALD), which won 11 of 26 contested seats in the 1990 elections (becoming the country's third largest political party) seeks to represent the Rakhine. 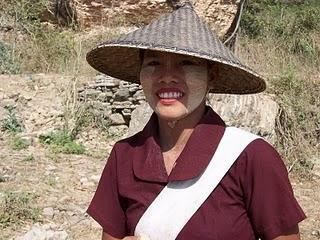 The Chin (also known as the Zomi) live mostly in the isolated mountainous region of northwest Myanmar, Chin State. The Chin National League for Democracy (CNLD) and the Zomi National Congress (ZNC) won three and two seats respectively in the 1990 elections, and though both were later banned by the authorities, they still work with the NLD and seek to represent the Chin. The Kachin are concentrated in Kachin State in the far north of Myanmar. Two major political bodies seek to represent the Kachin: The Kachin Independence Organization (KIO), with formal control over some functions of local government, and the Kachin State. The repression of ethnic minority activists in Myanmar National Congress for Democracy (KSNCD), which won three parliamentary seats in the 1990 elections. Most of the ethnic groups are Theravada Buddhism, however, Christianity is practiced in the region as well as other religions. The Shan live primarily in Shan State, in the east of the country bordering China, Laos and Thailand. There are smaller groups of Shan living through most regions of Burma, and near the so called Tai family, which includes most of the populations of Thailand and Laos. The Shan National League for Democracy (SNLD), was the second most successful party in the 1990 elections after the NLD, winning 23 seats. The Party Chair, Khun Htun Oo, is presently serving a 93-year prison sentence and is in poor health. Pa-O, also known as Taungthu and Black Karen form an ethnic group in Myanmar, comprising approximately 600,000. The Pa-O form the second largest ethnic group in Shan State. 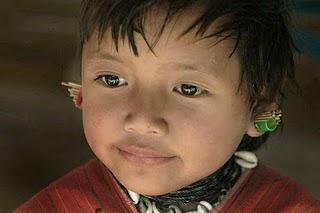 The Karenni are found in Kayah State in the east of Myanmar bordering Thailand. The armed opposition group, the Karenni National Progressive Party (KNPP), has splintered several times since its founding in 1957, but still seeks to be representative of the Karenni. Karen woman from Burma, photographed in Thailand as refugee. The Image was taken by Steve Evans from India and USA. Image is Creative Commons A2.0 Generic. 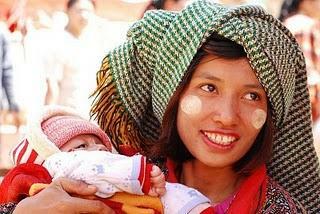 The Karen ethnic minority is concentrated in the east of the country primarily in Kayin State, however, they are present as well in Kayah State, the southern part of Shan State. The Karen National Union (KNU) has sought to represent the Karen since 1947. Most of these ethnic minority groups have stable political groups that represent their interest and some have armed groups in Burma. Some armed groups, however, exist independently in relation political groups. A number of them have agreed to ceasefires with the government. Some have agreed to become Border Guard Forces, BGF. Those who refuse to become BGFs will be facing a military attack by the tatmadaw for their refusal. According to Amnesty International, the Burmese military Government "often imputes involvement in, or support for these armed groups to ethnic minority civilians, and punishes them accordingly." Burmese women smear their as well as their children's faces, with thanaka. In between the fighting there are many civilians, farmers, students, workers, monks, traders, women and children. Burmese women smear their as well as their children's faces, with thanaka. This is the bark of a plant which is ground into a paste with water and applied onto the face. It is said to protect the skin against the sun - and it lightens the colour of the face. The deadline for armed groups to become Border Guard Forces (BGF) has been moved several times, putting pressure on ethnic armed groups on April 2009, again in the end of June, then extended to the end of October, and again to the end of December 2009, now it has been pushed indefinitely into 2010. Mother with baby in Myanmar. She is wearing a thick patterned scarf on her head and white thanaka circles on her cheeks; the baby is dressed for winter. Photo by Vera & Jean-Christophe. The armed groups conflicts usually occur in regions where civilians, women and children live in. The mother on the picture is wearing a thick patterned scarf on her head and white thanaka circles on her cheeks; the baby is dressed for winter. 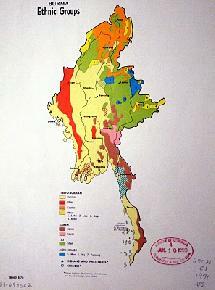 With an area of 676,578 km2 and more than 50 million people (according to a 2009 estimation), the population density in Burma is of 191.5 per square miles. "On 4 November, soldiers from Battalion 248 arrested a man from the village, accusing him of harboring guns or equipment for the Shan State Army-South (SSA-S), which he denied. So they tied him to a pole on the ground, and rolled a heavy rock over his lower leg until the skin came off his shins. Then they detained him in the village for ten days, before taking him away to porter for them elsewhere." These are some of the testimonies gathered by Amnesty International. Considering International Law and by Panlong Ceasefire Agreement, the fighting between Central Governmnet and Ethnic Groups and the witnesses report are outrageous. Since 1989 to 2000 under General Khin Nyunt's leadership and initiative, 19 ethnic minority armed groups - 16 from the seven largest ethnic minorities - have agreed to ceasefires with the government. While some believe ethnic groups to be hill people, with absolutely no culture, and primitive, they could not be farther from the truth. Just a glance at the history, their political involvement, their seats in Burmese Parliament, and even by looking at their statements, images, and web sites ,one can see they are committed, organized and strong. Other news attempt to spin the recent violence as if perpetuated constantly by ethnic groups. 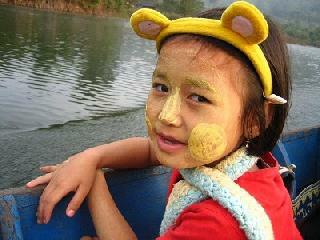 A picture of a Karen child (an ethnic group in Burma and Thailand) with Thanaka on her face. Image by Brian Adler, Image Public Domain. As Amnesty International states, "Ethnic groups have been portrayed as armed insurgent and ceasefire groups, who bankrolled by illegal drugs act on counter-insurgency campaigns by the military, boycoit dams, pipeline, and other development and infrastructure projects, and which are paid for by foreign investment as well as supported by mass internal and cross-border displacement, which relate with international aid agencies." However, they are not seen for what they truly are, that is opposition of government, cultural people and historically significant people, as well as people of the Land of Burma, who as all humans have human rights. Amnesty International states on the issue of ethnic minorities, "The authorities have monitored, harassed, discriminated against, detained, and imprisoned ethnic minority activists, in some cases torturing or killing them. With the elections as the political context in Myanmar for the past two years, and the government thus preparing to pit its own candidates against an opposition, it has not tolerated any group, including ethnic minorities in challenging its legitimacy, policies, and practices. The analysis should acknowledge the wide extent of popular opposition to the Myanmar government, and emphasize the need to ensure that Daw Aung San Suu Kyi, the NLD, and other political opposition groups - including those founded by ethnic minorities - are able to participate meaningfully in the coming elections." As the elections are coming closer, it is an illusion to believe that the violence was due to ethnic groups, and not incited by elections. However, it is good to see the violence "stop". As testimonies gathered in Amnesty international show it has never really stopped since 1998. Burma Military Junta Government "have used a combination of force and negotiation to this end, with the balance firmly on the former rather than on any political or economic incentives. The army and its allies have waged concerted offensives against several armed groups (and civilians), As a result nearly 5,000 Karen, 10,000 Shan, and over 30,000 Kokang were displaced during 2009 and the Kokang's armed militia, the Myanmar National Democratic Alliance Army (MNDAA)8, was defeated." Do you live in Burma? Have you been to Burma? Do you have a say on this article, or have images of Burmese people and culture? Feel free to contact us.